← Strabismus confirmed. Glasses ordered. Stella’s glasses are in. Arrived at Children’s Eye Care this morning. After her nap, currently failing to happen right now as evidenced by pained wailing, we’re schlepping back to the optical shop to fetch them. Reading is even better with practice glasses! Imagine how amazing it will be with REAL glasses and lenses! Thanks to the photographer: Cooper's mom. A lovely lady, dear friend, and playdate savior. During this morning’s playdate, she spent a couple of hours with her best buddy Cooper and his wonderful mom while I went out to track down some vanity frames. While I was scoring some white-framed, clear-lensed monstrosities at Forever 21 and a pair of sweet, sleek Ray-Bans at Macy’s (the former to wear indoors and the latter, much-needed ones to wear out), it turns out she was practicing–with Kevin-Garnett-esque focus. A trial run with vanity frames. Cooper's lens-free sunglasses tap into Stella's sporty, intense side while my white funksters really bring out the yellow in my dead front tooth. Our glasses motto is clearly "Go big or go home." No boring frames for us. Wait until you see her REAL glasses! From Paris with love! My dear friend was thoughtful enough to bring makeshift toddler vanity glasses–little sunglasses without the lenses–for Stella and her little buddy to wear. You know, just for fun! What? No! Not for any grander purpose like acclimating her in preparation for a possible lifelong relationship with spectacles! Ha! <Nervous, maniacal laughter.> Ahem. Her sweet, easygoing son is quite good about wearing them and today was no exception. After he sported them for a while, Stella started to come around. She proceeded to put them on and destroy her previous three-second personal record for donning frames. Of course, in truth, there is no grand finale expected when she gets her fabulous specs. Sure, we’ve done a lot of preparation leading up to today, which I realize has been as much for me as for Stella. We visited five different optical shops, an optician, and an ophthalmologist. Made dozens of stops at littlefoureyes.com, a site full of tips, community and encouragement for parents of babies and kids with glasses. We’ve read heartening stories about lovable characters getting glasses and discovering new clarity and skills (for example, Arthur’s shooting percentage goes way the hell up in the timeless, spec-centric classic, Arthur’s Eyes). I bought her the cutest onesie ever (which I first spied on a bespectacled cutie in the gallery at littlefoureyes.com), featuring a phat frog wearing glasses, which she loves. We’ve worn vanity frames (and I’ll continue to do so). 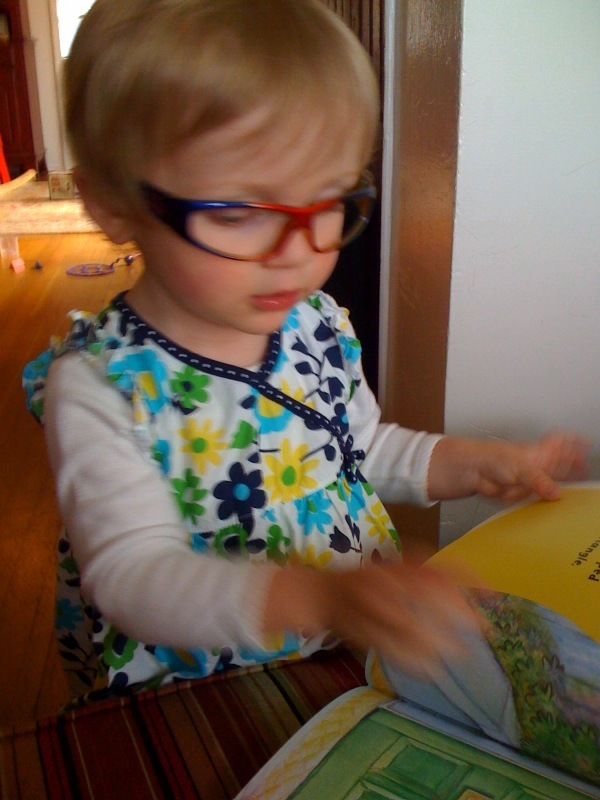 Mimi (that’s my mom’s “grandmother moniker”) ordered Stella a doll with glasses. And at every possible opportunity, as in whenever we see anyone wearing glasses anywhere, we excitedly point it out to Stella in an effort to convince her that glasses are super fun and, to use 80’s lingo, awesome to the max. That’s all well and good and we can rest a bit easier knowing we did some groundwork. But I’m aware that it’s probably going to take some time–possibly weeks–for Stella to be comfortable enough to wear them consistently and reliably throughout the day without throwing fits of rage. I’ve got to be persistent, because not wearing them is really not an option, but I will have to learn when a break is really needed, in order to prevent all-out war. Bottom line: I don’t expect her to cooperate right away, because this will probably just seem like an nonsensical, offensive nuisance to her at first–and really, that’s okay. But then again, you never know. When my sister was pregnant with her second child, they waited until she was “showing” to tell her then almost-5-year-old son James, the unsinkable kid who named his goldfish “Awesome,” that he’d soon be a big brother. People couldn’t resist asking him, casually and out of curiosity, “So James, ever think it would be nice to have a little brother?” He’d reply with a calm, cold and sure “No.” Well, all kinds of people kept posing this question until finally he exploded, shouting, “NO! Why does everybody keep asking me? I don’t want a brother! Now stop asking me!” Later, when they filled him in on his brotherly destiny, he was 100% thrilled with the “awesome” news. So, I’m not sure what kind of glasses battles are in store. It’s probably going to be tough as HELL, but maybe Stella will surprise me. Like when she casually eats the broccoli out of our take-out pad see ew. I guess we’ll see, won’t we? All will become clear soon. Yes, everything will come into sharper focus shortly. I just have to keep the end goal in sight. Assuming I can get a picture of her wearing them, I’ll post a photo of bespectacled Stella tomorrow. No more puns, I promise. Godspeed. 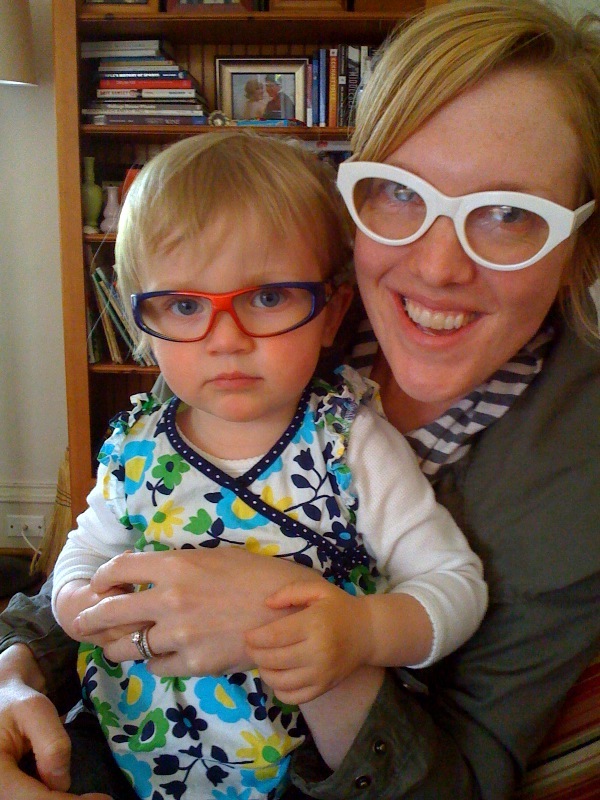 This entry was posted in Family update, Stella's eyes, toddler and tagged arthur's eyes, children's eye care, glasses, littlefoureyes.com, toddler, vanity frames. Bookmark the permalink. 2 Responses to Talking about PRACTICE. you’re an awesome mom Amber!